The Shanghai Gold Exchange (SGE) operates a comprehensive suite of gold trading services both ‘on Exchange’ (Price Matching market) and ‘off Exchange’ (Price Inquiry /OTC market). Contracts on 12 gold products are offered ‘on exchange’ while ‘off exchange’ trading offers contracts in 5 gold products. Transactions from both venues are settled and centrally cleared by the SGE. The Shanghai Gold Exchange was established in October 2002 by the People’s Bank of China. The goal of the Exchange at launch was to become the central hub of the Chinese gold market, a goal which has fully been met. The SGE classifies its gold trading activities into a ‘Price Matching’ market, which trades physical and deferred gold contracts, and a ‘Price Inquiry’ (OTC traded) market which offers bilateral spot, forward, swaps and options trading in an OTC ‘Price Inquiry’ environment. The SGE Shanghai Gold Price Benchmark auction, launched in April 2016, is additional to both the above SGE ‘Markets’. The SGE also facilitates gold leasing and pledging activities which are also distinct from its price matching and price inquiry markets. Although the SGE has a headquarters ‘Exchange’ building located in the central Huangpu District of Shanghai, all SGE’s trading platforms are electronic. The SGE also employs a central market clearing process to clear all of these products. An extensive network of 61 SGE gold vaults across 35 Chinese cities facilitates the vaulting, delivery, and transfer of gold that flows into and out of the vaults due to SGE trading. Membership of the SGE is divided into domestic and international categories. As of the end of 2016, the SGE had 253 domestic members which represented approximately 10,800 corporate customers and approximately 8.9 million individual customers. There are various member types within the domestic membership category. ‘Financial Members’ are authorised by the Exchange to engage in brokerage transactions and proprietary trading. ‘General Members’ are permitted to only engage in proprietary trading. The remaining domestic membership categories are ‘Special Members’ and ‘Proprietary members’. There is also an international membership category which includes international banks and international institutions. As of the end of 2016, there were 67 international members. In 2014, the SGE, in conjunction with the Chinese authorities, launched the Shanghai International Gold Exchange to advance the internationalisation of China’s gold and currency markets. 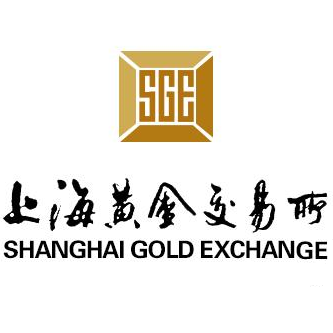 The Shanghai International Gold Exchange, also known in English as the ‘SGEI’, and the ‘International Board’, is a fully owned subsidiary of the SGE and is both registered in and physically located in the Shanghai Pilot Free Trade Zone (FTZ). See BullionStar Gold University article “Mechanics of the Shanghai International Gold Exchange” for full details. Given that the SGEI is known as the ‘International Board’, the existing Shanghai Gold Exchange is often referred to as the ‘Main Board’. The SGEI offers ‘international’ members access to Renminbi trading of gold on both the Main and International Boards. If trading on the International Board, the associated physical gold is vaulted in the International Board’s certified precious metals vault, located in the Shanghai Free Trade Zone. If trading on the Main Board, the associated physical gold can be in any of the domestic SGE vaults, however, International Members are not allowed to load in or load out metal from domestic vaults. 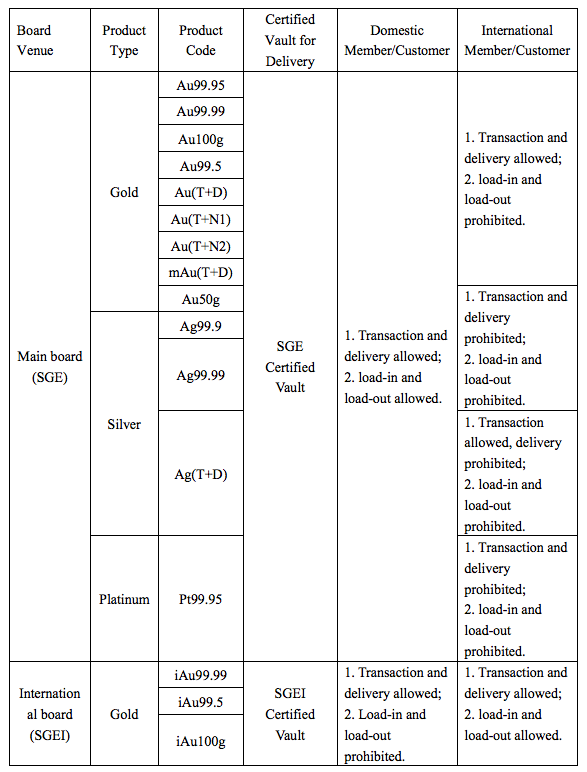 The SGE offers 16 trading contracts in its Price Matching market, 12 of which are in gold, 3 are in silver and 1 of which is in platinum. Of the 12 gold contracts, 8 are physical products and 4 are deferred settlement products. Exchange members and their customers buy and sell these contracts via the SGE’s electronic system, which then matches buyers and sellers by matching on executed price. For physical trading, sell and buy participants are required to hold the full amount of physical gold or cash funds respectively, before trading. Upon trade settlement, the SGE will credit the physical gold to the buyer’s account and credit the cash proceeds to the seller’s account. In 2016, the ‘Price Matching’ market recorded gold trading volumes of 15,200 tonnes. The SGE’s ‘Price Inquiry’ market is a bilaterally negotiated Over-the-Counter (OTC) market. Bilateral Over-the-Counter (OTC) trading refers to trading between participants ‘off’ exchange, with trade settlement on the SGE. OTC trading volumes therefore still feed into the SGE systems and are reported within the SGE’s published overall trading volumes. The SGE’s gold OTC contracts can be structured as spot, forward or swap. During 2016, 59% of OTC transactions generated were in Swaps, 29% in Spot and 12% in Forwards. There is also a separate set of SGE gold price options products under the Price Inquiry umbrella. The Chinese ‘inter-bank’ gold market, launched in January 2016, is a core part of this SGE OTC market. This ‘inter-bank’ market facilitates bi-lateral gold trading between Chinese financial institutions, and supports an official market making mechanism consisting of 16 market makers, 10 of which are large banks such as ICBC, Bank of China and China Construction Bank, and the other 5 of which are smaller Chinese banks. One of the main roles of the market makers is to enhance gold trading liquidity on the market. More than 50% of trading volume in the SGE Price Inquiry segment is traded through the China Foreign Exchange Trade System. In 2016, there were 55 institutional participants in the OTC gold market, 41 of which were small and medium-sized banks. Other participants include securities firms, fund management companies and trust companies. This market also uses 2 introducing brokers which are Tullett Prebon SITICO (China) Ltd, and Shanghai CFETS – ICAP International Money Brokering Co Ltd Reuters also publishes real-time quotes for these SGE OTC gold products. In 2016, the ‘Price Inquiry’ market recorded gold trading volumes of more than 8,800 tonnes. The SGE’s Shanghai Gold Benchmark Price auction is a twice daily auction for physical 1 kilogram gold bars. Its objective is to establish a benchmark gold price at which supply and demand in the auction is balanced. The SGE’s Gold Benchmark Price auction was launched on 19 April 2016. The auction utilizes an opening price known as a ‘Reference Price’ that is calculated from prices entered into the trading system by both ‘Fixing Members’ and ‘Reference Price Members’ during a 5 minute pre-auction window period between 10:09 am – 10:14 am before the morning auction and between 2:09 pm – 2:14 pm before the afternoon auction. Each round includes a ‘market tendering‘ segment and a ‘supplementary tendering‘ session. During the market tendering segment, all auction participants and their clients submit orders. During the supplementary tendering session, Fixing members can submit supplementary orders against the remaining imbalanced quantity. This is done so as to try to speed up the auction and end with an imbalance of less than 400 kgs of gold bars. An SGE Surveillance Committee oversees the auction’s functioning. This Committee comprises representatives from the SGE, ICBC, Bank of China, Standard Chartered Bank (China), ANZ Bank (China), China Gold Coin Corporation, Baird Mint, the China Gold Association, and the World Gold Council and has a remit of monitoring trading, clearing, delivery, in terms of the SGE Benchmark’s trading and compliance rules. Daily, monthly and annual prices for the ‘Shanghai Gold Benchmark Price’ and associated charts of this data are viewable on the SGE Benchmark web page on the SGE website. The SGE also offers gold leasing to its members and customers. This is distinct from the above contract trading discussed in the Price Matching and Price Inquiry markets. The SGE refers to these transactions as ‘Non-trading physical transfers’. In 2016, the SGE platform facilitated gold leasing on behalf of 31 commercials, representing 1700 tonnes of gold. These transactions are tracked via a ‘Master Agreement for Gold Leasing Transactions’. The SGE also offers other related services such as gold pledging and location swaps. International members can borrow gold from each other and also from domestic members of the SGE that have a gold import license. Accounts at the SGE comprise two components, a bullion account (for holding bullion) and a margin account (for holding cash – trading margin and clearing deposit). Anyone in China can open an SGE account to transact gold from. These accounts can be opened at participating Chinese banks. Alternatively, Chinese individuals can also open an SGE account via a smart phone application called Yijintong. Users of Yijintong first open an SGE account online and then execute SGE gold transactions online. In SGE documents in English, Yijintong is sometimes known as the ‘SGE Gold App’.